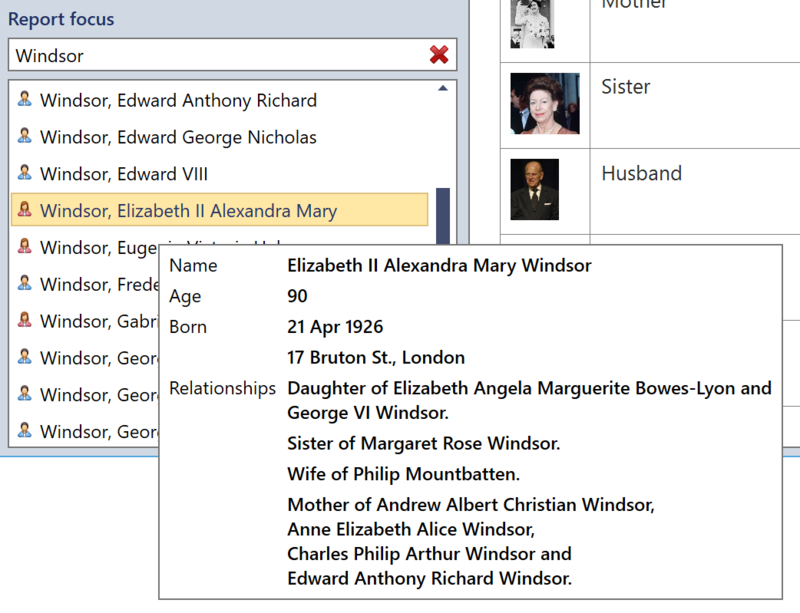 This feature allows you to create customisable reports about your family tree. You can choose from wide range of report content and customisation options. There are lots of reports which can be produced. The report list can be searched to quickly find the one you want. Fig 1. Choosing a report type. Family reports on a selected family group. Person reports on a selected person. 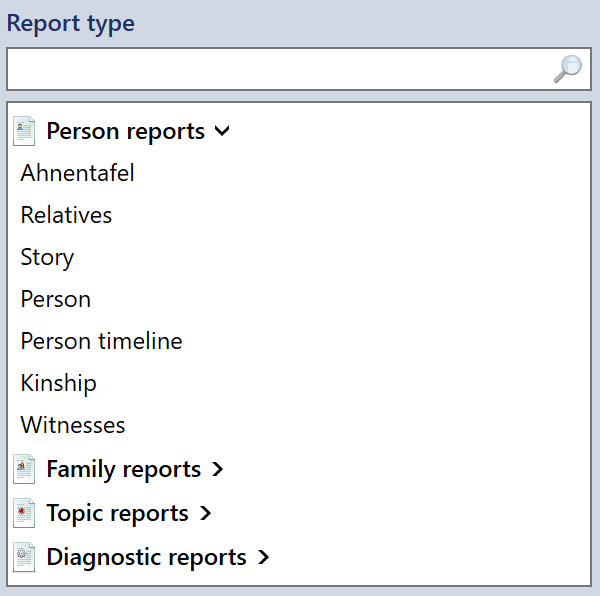 Topic reports about all family groups or individuals. Diagnostic reports which help to identify inconsistencies with the data stored in the file. 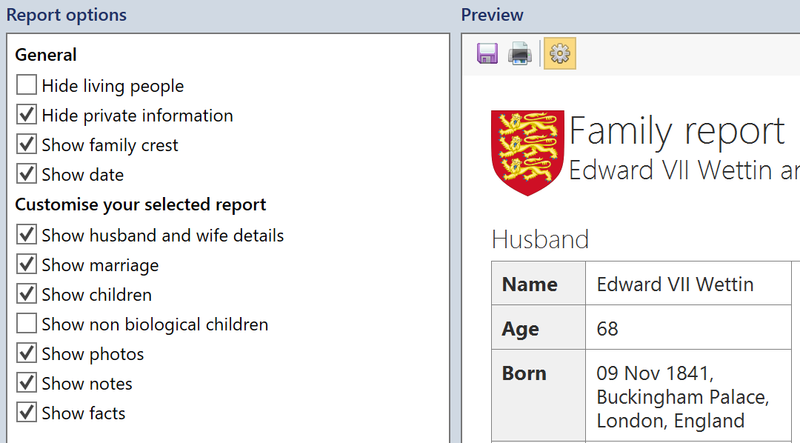 A list of available families and people is displayed when a family or person report is chosen. The list can be filtered to find the required item. Hover over an item to display extra information which may be helpful in making your selection. Fig 2. Selecting a focus. Each report has its own set of options for fine tuning the information included and layout of the report. Click the gear icon in the preview toolbar to access the options for the current report. Fig 3. Choosing report options. Reports can be previewed in My Family Tree. If you want to keep the report for later use, you can either choose to save it to your device or print it using the preview toolbar. Reports saved to your device can be viewed in all modern web browsers including Microsoft® Edge, Internet Explorer® and Mozilla® Firefox®. Any reports saved to your device are valid HTML5 documents. They can be further customised in a suitable editor. You can use privacy options to remove personal details of living people or people who have been marked as private within My Family Tree. Selecting the "Hide living people" option prevents export of all information about living people apart from their surname. Selecting the "Hide private information" option prevents export of any information marked as private. Note that information about private and living people is always exported in diagnostic reports.